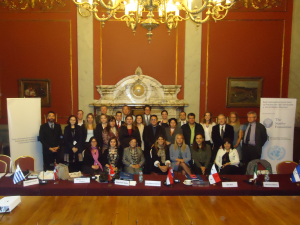 Alongside the Ministry of Foreign Affairs of Uruguay, the Stanley Foundation, and the United Nations Office of the Special Adviser on the Prevention of Genocide (OSAPG), the Auschwitz Institute for Peace and Reconciliation (AIPR) co-organized the VI Focal Points Meeting of the Latin American Network for Genocide and Mass Atrocity Prevention on July 25, 2016 in Montevideo, Uruguay. The Focal Points Meeting worked towards five concrete objectives related to the development and expansion of the Latin American Network’s activities. The meeting also served as an opportunity to promote collaborative efforts between member states, present initiatives that had been planned and/or implemented since the previous meeting, and to facilitate the continuation of major projects. Specifically, the VI Focal Points Meeting addressed the progress of, and challenges related to, long-term projects being carried out within the context of the Network. These include the research project on indigenous peoples being conducted by the OSAPG with the Network’s assistance and the status of the pilot phase of the project on Education and Prevention in Latin America, in addition to the numerous projects being carried out on the national level by member states. Beginning on Tuesday, July 26, the Auschwitz Institute joined with the Ministry of Foreign Affairs of Uruguay and the Stanley Foundation to hold the concluding half of the current Raphael Lemkin Seminar for Genocide and Mass Atrocity Prevention for the Latin American Network. 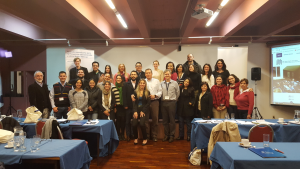 The multi-day training in Montevideo concluded the third cycle of bi-annual trainings which began in Poland in February of 2016, as agreed upon by the member states of the Network. From July 26-29, the Lemkin Seminar welcomed 21 government officials from Departments of Foreign Affairs, Human Rights, Education, Defense, and Ombudsman’s Offices in member countries of the Latin American Network. Participants benefitted from the “power of place” offered by the Seminar’s location in Montevideo through the incorporation of guided study visits to the Uruguayan Museum of Memory (MUME) and the Memorial in Remembrance of the Detained and Disappeared. 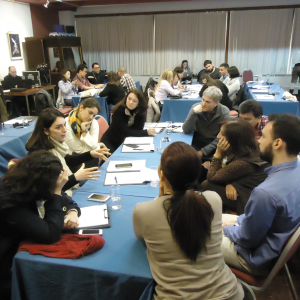 To realize the Seminar’s four curricular foci, each of the program’s working days focused on a specific theme. On Tuesday, participants explored the history and context of mass atrocities in Latin America, learning about civil military relations in the region and examining a case study on Uruguay’s Military Dictatorship. Wednesday’s activities were devoted to the role of Memory, Truth, and Justice in the prevention of mass atrocities, with a screening of the film El Juez y El General. Thursday’s focus was on indigenous populations in Latin America and included case studies of indigenous communities in Brazil and Bolivia. Concluding the seminar, Friday’s programming was dedicated to the teaching, protection, and recovery of human rights in Latin America, with modules on strengthening human rights, LGBTI issues, and the role of Peacekeeping Operations in the prevention of genocide and mass atrocities. The Seminar’s approach allows participants to fully delve into the themes and challenges involved in work on the prevention of genocide and other mass atrocities. 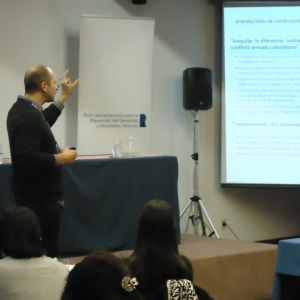 In this context, the conclusion of the third cycle of Raphael Lemkin Seminars for Latin America (2014-2016) confirms the motivation and interest of regional government officials to continue and expand upon these opportunities for reflection and collaboration.